Motion Gaming is here… …again. 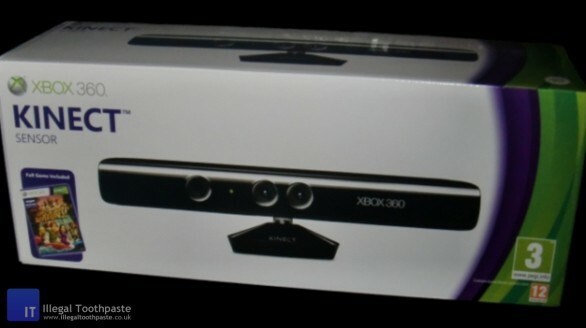 As the new Xbox 360 Kinect (Previously known as Project Natal) is released in the UK, I managed to get my hands on one. No I didn’t buy one, I already have a Wii that I don’t play, To Begin with I set up the Kinect Sensor underneath my Television which despite being an LCD sits on an old CRT TV stand so I have lots of space in front of my LCD for controllers, DVDs and general rubbish. I cleared away this rubbish and sat it in the middle although it seemed to be pointing at the floor so I thought I’d tilt it upwards, it made an unpleasant click sound as I tilted it on it’s stand, obviously one of the instruction manuals I had tossed aside would probably have told me not to do that, but I carried on setting it up under the assumption that Microsoft wouldn’t release something that breaks when you twist it slightly, this is a big assumption I know but with everything plugged in, I was ready to begin. I turned on the Xbox 360 Console and the Kinect Sensor burst into life tilting down at the floor I wondered if this was because of what I had done to it but then it started looking up at the ceiling so I figured it was just doing some weird calibrating. The Xbox 360 prompted me to download an update for the Dashboard (That’s right I haven’t turned on my Xbox 360 since before the Dashboard Update at the beginning of November) After that it recognised the Kinect Sensor and prompted me for another download, I presumed this sort of thing would be included in the Dashboard Update unless some big bug had been found since the Kinect launch that requires another update. I went through the Kinect setup and straight away it threw up an error complaining that it couldn’t see the floor, it is after all a spectacular floor I find myself gazing at it for hours on end, but my TV stand was in the way, I tried to explain that I needed that extra foot of space but I hadn’t setup the microphone so my reasoning was unheard by the Kinect sensor. I continued the setup it asked me to move so it could see me I backed up against my bed, which is already as far back as it will go, no longer complaining about not being able to see the floor, it now could not see my head so I ducked down a bit which confused it even more apparently I need to tilt the camera up so it can see me, obviously now unimpressed with my floor. The setup continues with the Audio it checks the background noise level, then it wants to play some sounds I say fine, but Kinect says no that is too quiet, but I say no it is just right for it is night time and people are sleeping, Kinect stares back blankly, fine I say I will turn up the volume but if anyone complains I’m telling them you forced me to do it. Kinect plays the sounds again on to the next step so I turn down the volume again, not yet says Kinect it wants to play the sounds again but from one speaker then the other then both and it repeats again and after this step it tells me I can turn the volume down, apparently the sound has something to do with it recognising my position. Congratulations, New Kinect Feature Unlocked: Sonar! Now the Kinect setup is over I now have the new Dashboard introduction to go through, obviously Microsoft have noticed that I haven’t been playing my Xbox 360 much recently as it tells me how to use the Xbox 360 controller, as I have obviously forgotten in my time away, but wait surely this is all redundant now, I throw my controller in the bin and command the Xbox 360 to Exit this tutorial, Kinect stares into the distance, Xbox I say Continue past this needless introduction, Kinect begins to fidget, I reluctantly retrieve my Xbox 360 controller from the waste receptacle in which it was recently tossed. It seems to still be on so I use this outdated user input device to continue past the introductory tutorial to the new Dashboard, but then a section on Kinect appears of course it was waiting for me to get to this part, finally I can put the controller down, the controller once again soars through the air, Kinect looks on and says nothing. Xbox Continue I say, nothing, Xbox Go, nothing, Xbox Start? Nothing, perhaps a motion is required to regain control after all I am the controller now, I wave at the Kinect Sensor, Kinect appears not to notice, I move around a bit perhaps it can’t see me, Kinect remains motionless, the controller is once again recovered from the bin, I decide that I should not be so quick to throw it away perhaps I shall recycle it when it becomes truly redundant anyway. The setup, introductions and tutorials are all done maybe now I can try out some of these Kinect features. I sign out to see if it will recognise me with the Kinect Sensor, it does not, apparently I need to go into the Kinect Hub and select Kinect ID before I can do that, I decide to try out voice commands while I watch a video I even preface this with voice commands in the Kinect Hub Xbox Open Tray, I insert a DVD, Xbox Close Tray, Xbox Play Disc, However once the DVD starts I get no response from Kinect, it would seem that Kinect does not respond while playing a DVD but perhaps only when using the Video Player or some sort of Video Streaming service. But Voice commands seemed to work quite well in the menus working first or second time I say them. 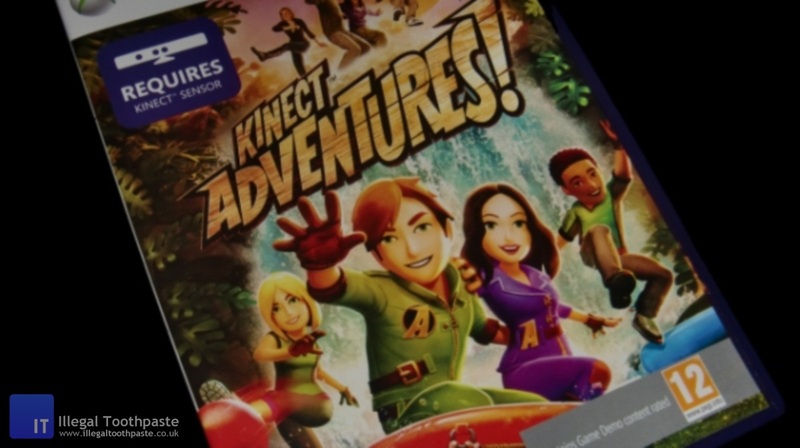 The Bundled game is Kinect Adventures, finally I can jump up and down in my living room and pretend I’m in an inflatable raft, and for added realism give a family member or a friend a bucket of water and get them to splash you with it as you play. I will play Kinect Adventures a bit more before giving my final opinion but Microsoft have done something right by including demos for 3 other Kinect titles Dance Central, Kinect Joy Ride and Your Shape: Fitness Evolved. Out of all the Kinect games Dance Central looks to be the only reason to own Kinect right now, I look forward to trying out this demo. Also for extra fun guess how many times the word Kinect is used in this article, put your answer in the comments below and the first right answer will be shammed for cheating having counted the number of times and not guessing. Please Note: I only once started typing Wii during the writing of this article and that’s not including the intentional one at the start or the one at the beginning of this sentence.